The best selection of apartments together with a wide choice of B&Bs, villas and countryside homes for rent in Lucca. With more than 7 years of experience Vacation in Lucca offers various accommodations for the best experience: short term rentals in the old town of Lucca, in the Lucchesi hills and in prime countryside locations. A wide choice of apartments for short term rental in Lucca. We only offer charming holiday apartments located in the old town of Lucca. 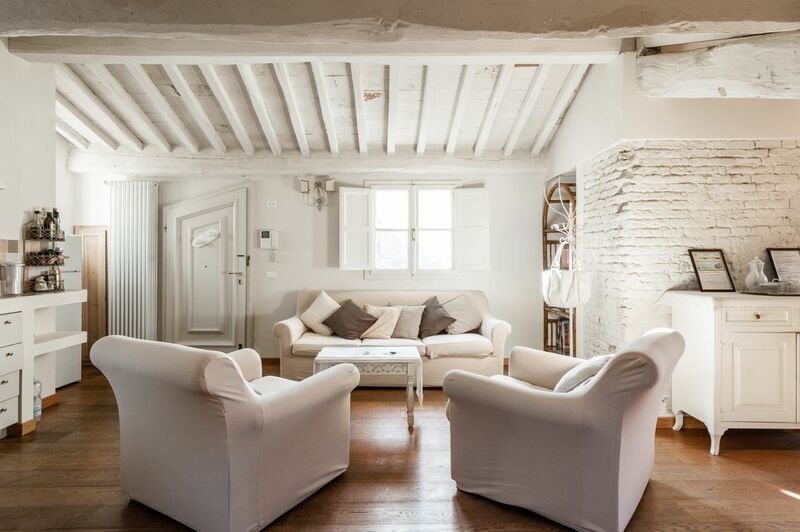 A selection of Bed & Breakfast properties in the old town and in the countryside of Lucca. A stylish and comfortable stay in rooms with breakfast included. A selection of holiday homes for rent located in the countryside of Lucca. Relaxing locations together with all the comforts of an independent home. Farm houses and luxury villas for rent located in the hills around Lucca. Stylish and comfortable traditional Tuscan accommodations. We periodically add new properties to our collection after much research. We ensure each property we offer on this website offers the highest quality in order to provide the best experience for our guests. 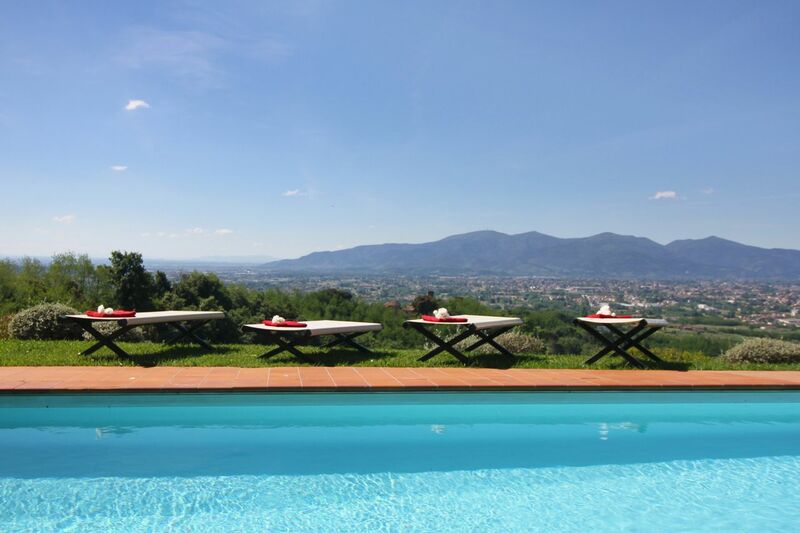 This exquisite Villa is just a short distance from Lucca's historic centre (10 km). Nestled between olive groves and orchards, it was once home to one of the most prominent noble family of the area: the family Mansi- Bernardini. Over the centuries, this luxurious home has hosted many famous personalities. Today, it hosts a luxury BB with 5 magnificent bedrooms all with en suite bathrooms. The Villa Bernardini-Mansi is part of a vast estate with several properties: in addition to the B&B, there are also 3 luxury villas with private pool and a characteristic holiday farmhouse (Agriturismo il Borghetto) with 5 country houses that share a beautiful swimming pool in the Tuscan countryside. The entire estate can accommodate up to 84 guests and is an ideal location for group retreats or weddings. 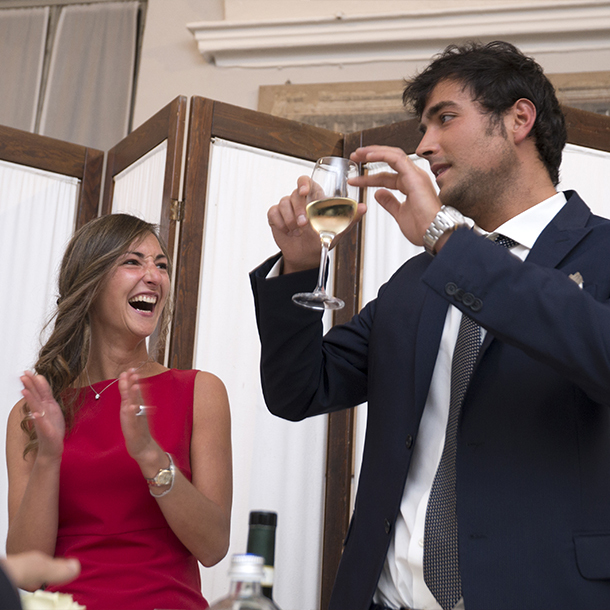 The Villa Bernardini is the perfect venue for an unforgettable wedding. Refined and exclusive, the Deluxe Room is well appointed with antique furniture and offers amazing view of the Villa's grounds. It contains a double bed with en suite bathroom with shower. Every detail has been carefully considered to create perfect harmony between comfort and elegance. Relax by the panoramic swimming pool; take a carefree walk among the olive groves; enjoy a tennis match in the farmhouse-estate. Live Tuscany at its best. Each morning a continental breakfast is served using only locally sourced high-quality produce. During the warmer months, you will enjoy breakfast by the panoramic terrace; while in winter months, breakfast is served inside the elegant dining room. The farm-estate produces fine olive oils and honey. Restaurant (open only a few months of the year). Reservation is requested. 1)Check in time is from 15:00 to 19:00 If you arrive later than 19:00hrs, you will be subject to an additional of 10.00 euro for each hour of delay. We don't check in after 23. Late check in must be arranged in advance and is subject to availability. 2)The B&B is not suitable for children younger than 13 years old. 3)Check out time is not later than 11.00 am. The apartment Claudia is a marvellous penthouse located on the 3rd floor of a stately building (with elevator) in the historical town of Lucca, just 10 meters away from the Tower Guinigi and offers a breath-taking view of the Tower and of the old town. Decorated with Provencal furniture, this charming apartment can accommodate up to 4 guests; and features 2 bedrooms with en suite bathrooms and a large living area with kitchenette and dining table. Our guests can enjoy a flat screen Satellite TV. Parquet floors and white wooden beams make the atmosphere refined and exclusive. The penthouse is also equipped with modern conveniences: air-conditioning, Wi-Fi, modern bathrooms with shower and a fully equipped kitchen. Every detail has been carefully considered to make your stay truly memorable! 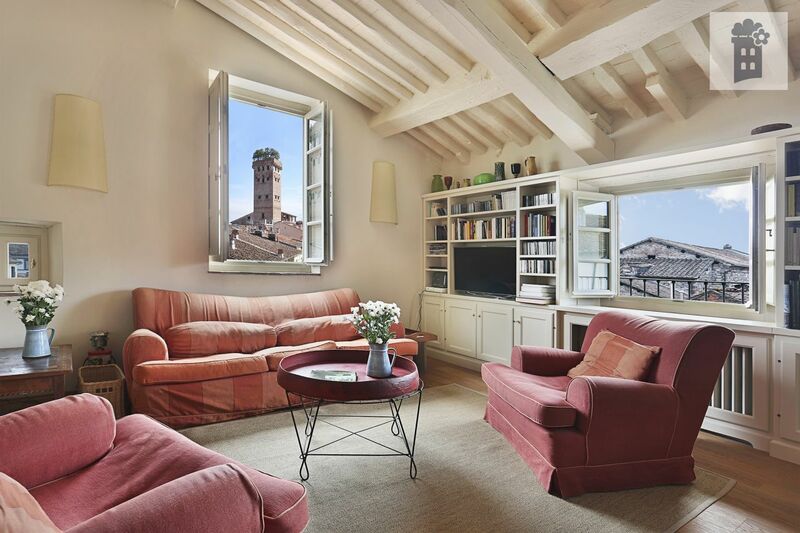 The penthouse offers an amazing view of the rooftops of Lucca and is very bright. A romantic spot for your Lucca vacation. 1) The apartment is located on the 3rd floor of a building with elevator. The elevator reaches up to the 2nd floor. From the 2nd floor to the 3rd there are about 10 steps. 2)Check-in time is from 15.00hrs to 19.00hrs. If you arrive later than 19.00hrs, you will be subject to an additional of 20.00 euro. We don't do check- in after 21.00hrs. Guests arriving later than 21.00hrs will be subject to pay the penalty as a "no-show". No reception on site. You are pleased to communicate your arrival time at least 24hrs in advance. 3)Check-out: not later than 11.00 a.m.
4)A refundable damage deposit of 200,00 euro is requested at the check-in. The deposit will be refunded to you at the check out if there are no damages at the apartment. You can secure the damage deposit by credit card through the system of the pre-authorization. The apartment Isabella is located on the 3rd floor (with elevator) of one of the most prestigious building in the historical centre of Lucca: Palazzo Fatinelli. Over the centuries, this building has hosted many famous personalities from Lucchese nobility. The building’s impressive main foyer was traditionally used to host important events/balls. Today, it has been completely restored and the Apartment Isabella is located on the top floor of this prestigious property with breath-taking views of the city. The Guinigi Tower (one of the most important attractions of Lucca) is so close to the window, you can almost touch it! The apartment can accommodate up to 2 guests and an infant in a baby cot. It features one double bedroom with en suite bathroom with shower and an impressive open-space living area with a 360° view of town. The living area hosts a modern and fully equipped kitchen with induction oven, a dining table for 4, and a leisure area with comfortable sofa, armchair and Satellite TV. Our guests will enjoy the amazing panoramic views from the sofa or read a book from our library or listen to classical music from our album collection. Close to all the city’s major tourist attractions and recently renovated, the apartment offers its guests a feeling of peace and tranquillity. The stylish light colours of furniture blend with the magnificent coffered ceilings and beautiful inlaid parquet floor to create a memorable experience for guests to appreciate the historic style of the building. The apartment offers WI-FI, Satellite TV, air conditioning and a fully equipped kitchen: electric kettle, dishwasher, washing machine, toaster, coffee maker, flat screen TV, iron/ironing board, hair-dryer, oven, cookware, tableware and household utensils. 2)Check out: not later than 10:00/a.m. 3)A security deposit of 150,00 Euro is due at signing the rental agreement and will be pre-authorized from your credit card. The deposit does not apply towards the rental fee. The security deposit will be charged only if there are loss or damage to the property. Villa Bernocco is a charming villa inside a private estate situated in one of Tuscany’s best areas in the countryside; between the medieval town of Lucca and the famous beach resorts of the Versilia area. Carefully restored, the Villa offers its guests a sensation of peace and cosiness. The stylish light colours of the furniture create a delicate atmosphere where guests can breathe the original air of the true, antique style of the house. The Villa can accommodate up to 10 guests and features 5 bedrooms and 4 bathrooms. The classical elegance of the Villa can be seen from the magnificent wooden beamed ceilings, the beautiful terracotta floors and antique furniture that have for many generations belonged to our family. The charm and attention to detail make this property refined and exclusive: a place where your stay will be an unforgettable experience. 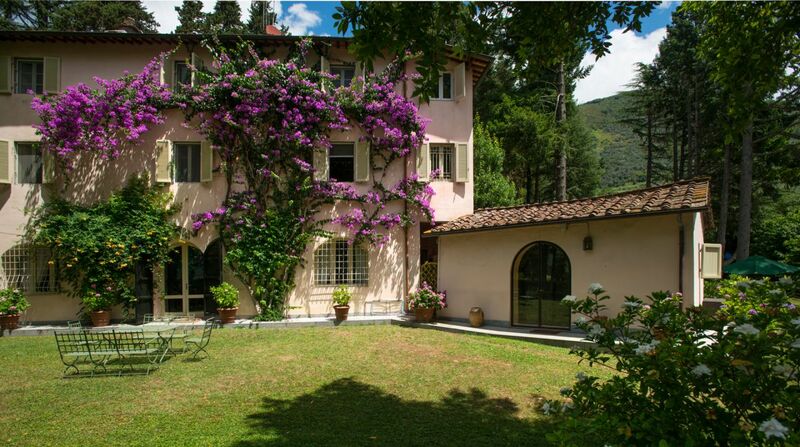 Villa Bernocco is a 3-story house with 2 entrances. The front entrance of the Villa leads to the ground floor, where there is a spacious living room with various seating areas and a TV area with a selection of DVD movies. Adjacent to the Villa, on the ground floor, there is a cosy addition (extension of the house) with separate entrance. The ‘addition’ features 2 single beds (can be converted into a double upon request) and a private bathroom with shower. The room is very bright thanks to the big French window overlooking the garden and the surrounding hills. The back entrance of the Villa leads to the first floor, where there is a fully equipped Tuscan kitchen and a large dining area with a dining table that can seat up to 14 guests. The first-floor also features a sleeping area with 1 bathroom with shower and 2 bedrooms: 1 double bedroom and 1 twin. The second-floor contains 2 master bedrooms with en suite bathrooms. Recently renovated, it offers a heated salt water swimming pool with sun loungers, a superb alfresco dining area with BBQ grill and a big garden with views of the surrounding area. Decorated with rustic yet elegant details, this Villa included Wi-Fi and air-conditioning. Cozy dependance (extension of the house) with independent entrance. Inside the dependance there is one bedroom with 2 single beds (they can be converted into a double) and a private bathroom ensuite with shower. One double bedroom with bathroom ensuite (shower and tub). One double bedroom with bathroom ensuite (shower and tub); a cabin clothes. 1)Check in time is from 16:00 to 19:00. If you arrive later than 19:00hrs, you will be subject to an additional of 10.00 euro for each hour of delay. We don't check in after 23.Late check in must be arranged in advance and is subject to availability. 2) Check out time is not later than 10.00 am. 3) A refundable damage deposit of 500,00 Euro must be paid at the check in. It will be refunded at the end of the stay if there are no damages at the property. We have carefully selected our properties in order to offer an unforgettable experience. Click on your favorite collection and discover all the properties with unique features for your best stay in Lucca. With our passion for excellence, we were soon voted #1 B&B in the world by Booking.com. This passion continues and now includes property management and other opportunities that will enhance our guests' experiences. Our adventure was born in 2013 with the launch of Guest Apartment Margherita, a charming B&B located in the old town centre of Lucca. We expanded our offerings to include a selection of hand-picked accommodations located in the old town and in the Lucchesi hills. In 2019 we opened Vacation in Lucca, a rental agency for our expanding clientele.